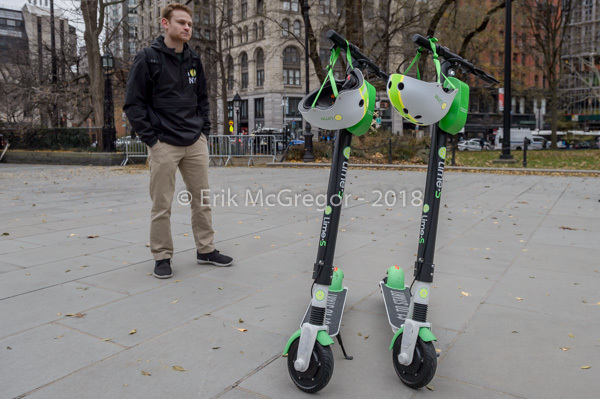 New York NY – NYC council members and advocacy groups held a press conference at the steps of City hall on November 28, 2018 to deliver a statement on NYC Council‘s legislative bills to legalize e-bikes and and to protect NYC working cyclists as the city moves to introduce e-scooter and e-bike options. It has been just over one year since Mayor de Blasio announced his e-bike crackdown in NYC, and delivery workers who use e-bikes still face criminalization for doing their jobs. Workers are still being pulled over by the police, getting tickets, and having their e-bikes conﬁscated while the employers that require them to use the e-bikes are left alone. Therefore, we welcome the legislation sponsored by Council Members Espinal, Cabrera and Rodriguez. 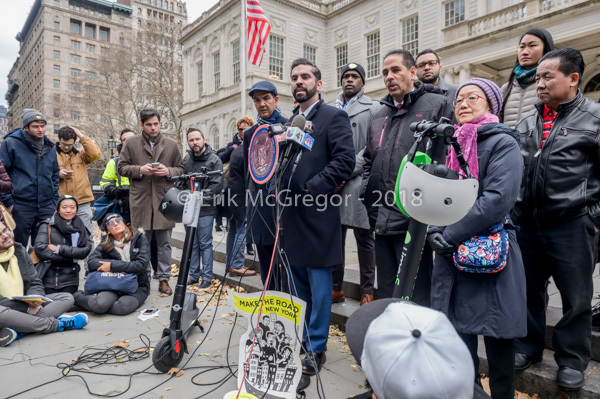 These bills take critical ﬁrst steps in decriminalizing the delivery industry we all rely on by creating a regulatory framework for e-bikes, reducing fees and confiscations, and creating a fair pathway for delivery workers to come into compliance. 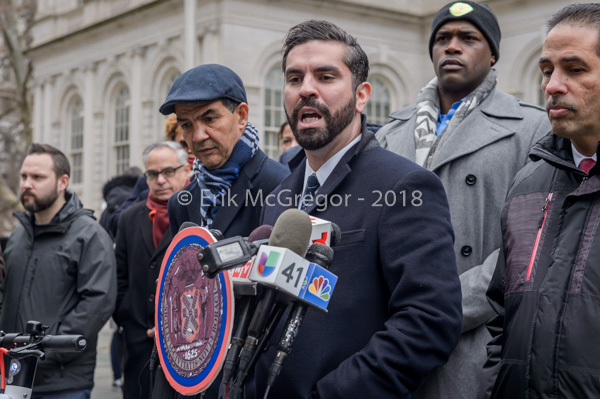 We look forward to working with the City Council to ensure that the details of the legislation create meaningful outcomes for delivery workers. 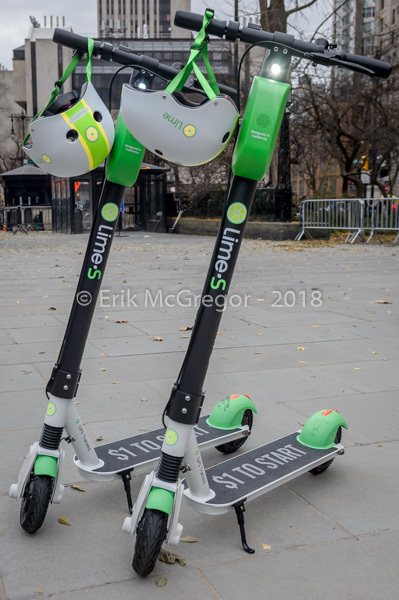 As the City moves to introduce e-scooter and e-bike options, it is important that the City Council moves swiftly in making sure this legislative package includes this e-bike legalization framework as soon as possible. For over a decade, delivery workers have been left out of the framework and we hope this is the beginning of a new dynamic that includes delivery workers. 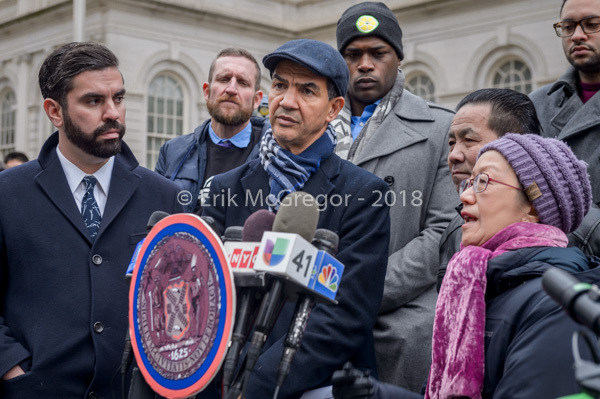 We also look forward to working with the New York State Legislature to pass similar legislation, as delivery workers will remain vulnerable to ticketing from NYPD due to vague New York State Traffic Law. Because of this, we continue to urge NYPD to issue a moratorium on enforcement against delivery workers using e-bikes until the details of this regulatory framework are clariﬁed and delivery workers have a legal and fair way to do their jobs. 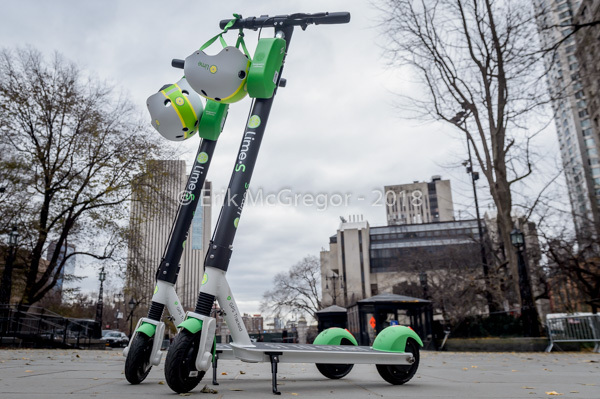 Modify Current Enforcement Practices: Issue a moratorium on enforcement and/or impoundment of e-bikes by the NYPD until a regulatory framework that allows for conversion has been fully implemented in New York City. Establish Regulations for E-bike Conversion: Issue guidelines and requirements for converting existing e-bikes commonly used by delivery workers into legal e-bikes. Fund a Pathway to Substitute All Illegal E-Bikes: Establish a non-onerous program that provides ﬁnancial and practical assistance to owners of illegal e-bikes for conversion and/or replacement with legal e-bikes, including Class 2 throttle e-bikes. Educate All Parties: Educate the public, restaurant owners and workers, and train NYPD officers about the above changes. Create Transparency: Start recording and publishing detailed data of e-bicyclists’ involvement in trafﬁc crashes.